The world stands on the brink of catastrophe. The year is 1926, and an elder being of unfathomable power threatens to awaken from its long slumber, bringing death and madness in its wake. Strange cults and unspeakable monsters wreak havoc on every continent as the fabric of reality tears itself apart, opening gates to bizarre other worlds. Only a few, brave investigators understand what is truly happening. These tenacious souls come from every walk of life to pit their skills and weapons against the threat of the Ancient One. It falls to them to explore the most remote corners of the globe, to fight the nightmarish creatures that lurk in the shadows, and find the answers to the ancient mysteries of this Eldritch Horror! Very thematic and fully cooperative and with the extremely varied player count and story situations you will almost never play the same game twice. Another great Cthulhu and team mythos board game! 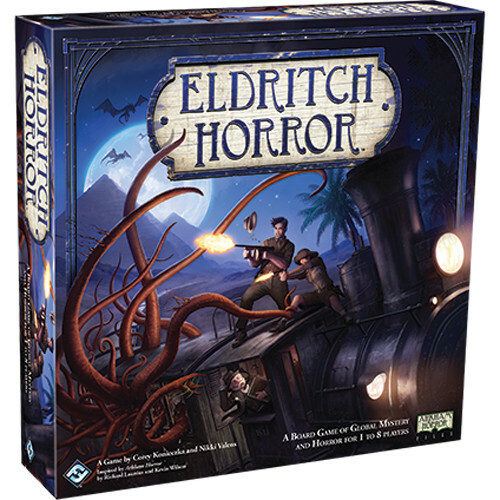 In Eldritch Horror you (and up to a total of 8 players) are tasked with discovering clues that will ultimately lead you to stopping the summoning of an elder god into your world. So first think I would like to point out is the number of players you can have in this game. 8! Yes you can have up to 8 total players which is pretty nuts, and what is even more nuts is that this game can be played solo as well. And honestly I actually prefer playing it solo. The way the rules change to accommodate more players is by adding more spawning enemies or gates and the like. Basically just adding more all-around “stuff” to the game board so there is a lot going on. There are a TON of components to this game (see my pic). You will spend a decent amount of time setting the game up for play. Let me think……I just played last night so this is still pretty fresh….there are multiple stacks of cards that differ, multiple stacks of tokens that differ and of course your player sheets with whatever inventory you have and your life and sanity tokens. You have a smaller sized card pile of inventory assets (your weapons and ally’s etc. ), a small card sized pile of Artifact cards (your trinkets), a pile of small cards for the conditions of your characters (status effects like dazed or bless etc. ), a pile of small cards for spells (spells you can cast). Then we move on to our normal sized card piles. Let’s see there is a pile for each of the differing grouping of locations to draw from depending on which location on the game board you are located. 4 of those piles. Then there is a general location pile for those locations that are not named cities. After that we have a pile for expeditions to draw from that change throughout the game. Then we have the other worlds pile that you draw from when you try to close a gate on the board. Then the 2-3 piles for whatever elder god you are trying to stop, these are drawn when you pick up clues and when you complete mysteries. Oh and let’s not forget the famous Mythos deck which is drawn at the end of the round. Phew. After the card setup you have a nice variety of tokens to keep separate. These consist of the health and sanity tokens, stat improvement tokens, travel passes of the ship and rail variety, rumor tokens, eldritch tokens, clue tokens, gate tokens and a smorgasbord of enemy tokens of the regular and elite variety. Suffice it to say that this game is a beast to get setup. I’m not even going to go into what you have to do with the cards starting out having to sort the mythos deck based on what elder god you choose and all that. The gameplay is…….complicated but not NEARLY as bad as the setup. The first time I got this game out I was SO overwhelmed by the setup that I had it in my mind that the game play was going to be horrendously complex. But honestly the gameplay isn’t that bad. There is a manual for the directions and also a reference manual that has all the little tidbits of rules for a quick lookup. On the back of the reference manual is a 1 page easy to read and understand game play order. Just keep that handy when you start your turn and you can follow right along with it to easily grasp what you are supposed to do. The gameplay boils down to each player taking 2 actions like moving or resting etc. and then an encounter happens at whatever location they are at. The encounters are where you also fight monsters and when you get those delicious clues you need. After the encounter takes place then the mythos card is drawn and “stuff” happens on the board. Like more gates opening and more enemies swarming through or more clues appearing on the board. Once the mythos phase is over then you start again with your 2 actions and rinse/repeat. To win the game you have to complete 3 mysteries which lock away the elder god. To complete mysteries you are usually tasked with finding clues and completing objectives in a certain way. For example one of the mysteries you have to complete has you close a gate but you also have to discard 2 spells to complete the mystery when you close the gate, makes the game much more dynamic. To lose the game however a few things can happen. Either all the players are killed, the doom track reaches 0 and the elder god is summoned and then you lose the ensuing battle with the god or the mythos deck runs out of cards. Speaking on when players are killed a bit. I found this aspect really cool as when you either go insane from losing all your sanity tokens or wounded from losing all your health tokens. You flip your player card over and there is a whole section based on each of those aspects that you read. Usually another player will have to pass some sort of test with rolling the dice based on their stats. And this will determine what happens to your character and them. Either way you are out of the game after that. It’s a really awesome and thematic way to leave the game. Theme. This game oozes theme. If you are looking for a good Lovecraftian themed game this one is one of the best. There are TONS of story elements and things to read aloud to the group to create a very tense and ominous story situation. And there are so many different options to choose from based on your location on the game board that you will be hard pressed to read the same text twice after multiple playthroughs. The game length for 1-2 players is about an hour, perhaps an hour and a half. I haven’t tried with a full 8 players but I suspect the time wouldn’t be that much longer as you still have to contend with the ever present doom track that seems to always be counting down to your demise. There are no minis in this game so if you are looking for that you will have to look elsewhere. They utilize cardboard standees for the characters and little cardboard tokens for the enemies. The quality is very good in the board and cards as well as the tokens. However there are no plastic pieces save for the player standee bases. That said the cardboard is all very well made and looks to be something that would last a long time. No warping in the board or anything like that. All in all I really like this game. Very thematic and fully cooperative and with the extremely varied player count and story situations you will almost never play the same game twice. Highly recommend. Always have a blast. Easy to learn and fun to play. I've only ever played with 4 people, but I like the fact that up to eight people can play. Wonderful Co-op game full of great pulp-horror play! Eldritch Horror is a fantastic cooperative experience that benefits from all the years Fantasy Flight spent making content for Arkham Horror. The mechanics are nice and clean, and feel like a much smoother take on complex cooperative play than most games made before it. 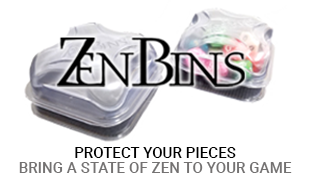 The components are everything you'd expect from FFG. 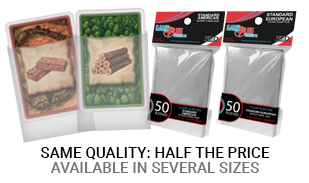 High-quality, linen-finish cards, great cardboard pieces and board. Nothing super flashy that would make me give them a 5, but solid stuff. The one exception being their now standard, completely useless box insert. The only blow to the Value score in this game is the low number of cards per deck in the base game. Replayability relies on expansions to be high. If you play too many games with just the base box at hand, you're going to see a lot of the same encounters and events over and over again. Thankfully, there is a lot of really great expansion content for the game to address this, but the fact that some amount of additional purchase is pretty much required after a few sessions is a bit of a bummer. I love this game , it's really good! The game has an interesting thematic , beautiful components , and is very immersive . Unfortunately, my group does not like it because it is a collaborative game. If your group has no problems with collaborative games and the like Lovecraft and Cthulhu universe I recommend this game , but remember it's not a game for beginners. And careful not to go insane !! This game is what Arkham should have been. In fact I recommend throwing away your copy of Arkham once you pick this up. I doubt you will ever go back. This game adds more player interaction. While its not alot, it is leaps and bounds over the downtime that Arkham has. Minis are standard FFG quality sculpts are ok, Card stock is good. More tokens that Cthulu could shake a tentacle at. Each old one ads a different experience and theme that adds replayability. Grab this one before the END!!! Eldritch Horror first got introduced to me during a board game night that I originally came to for another one of my favorite board games however everyone chose to play this game first then the one I brought second. At first glance this game almost looked simplistic given it's simple "map with paths) nature and of course like any FFG it came with tokens galore however when looking past all that I became fascinated in the Sci-Fi of it while being even more enticed by the 1920s time period it brought to the table. It was intuitive and fun without my having to figure out what a plasma coil inducer was. This game is a coop game which works out great for me because I hate games that get so hell bent on destroying your fellow player that it just doesn't become fun anymore. This game however is not at all like this. The only issues that you will have is the veteran players thinking that additional players are simply their pawns to boss around instead of actual live breathing players. This game's main kicker for me buying it was the ability to play single player, and yes I mean it plays single player quite nicely, not you having to pretend that there is another player, you actually being able to be the only character on the game board. The second most important reason for my buying this game was simply that the re-playability is near endless. Sure you might revisit the same encounter cards a few times over a few games (never in the same game so far) but besides that, the loops this game throws at you always keep you guessing. This game has been a real thrill to play and proved quite easy to teach my friends so we play at least once a week if we can. I recommend buying this if and when you can.